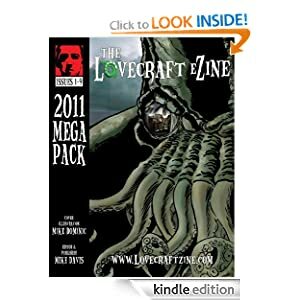 The Lovecraft eZine, a monthly magazine featuring Lovecraftian horror and the Cthulhu Mythos, has released a couple of collections or “megapacks” of stories for purchase as an ebook. The first, collecting issues 1-9 of the eZine, includes my story The Slickens. Given a “thumbs-up” by Lovecraft guru S.T. Joshi, The Lovecraft eZine regularly publishes well-known writers such as Stephen Mark Rainey, W.H. Pugmire, Ann K. Schwader, Joseph S. Pulver, William Meikle, me and many more. The stated goal of The Lovecraft eZine is “to provide high quality Lovecraftian fiction at a reasonable price,” and I’d say they’ve pretty much knocked it out of the park. If you like Mythos fiction, it’s a publication and community well worth checking out! You can also get a copy of the 2012 megapack here.